Went riding yesterday with an 80-year-old rider. 350+ miles. 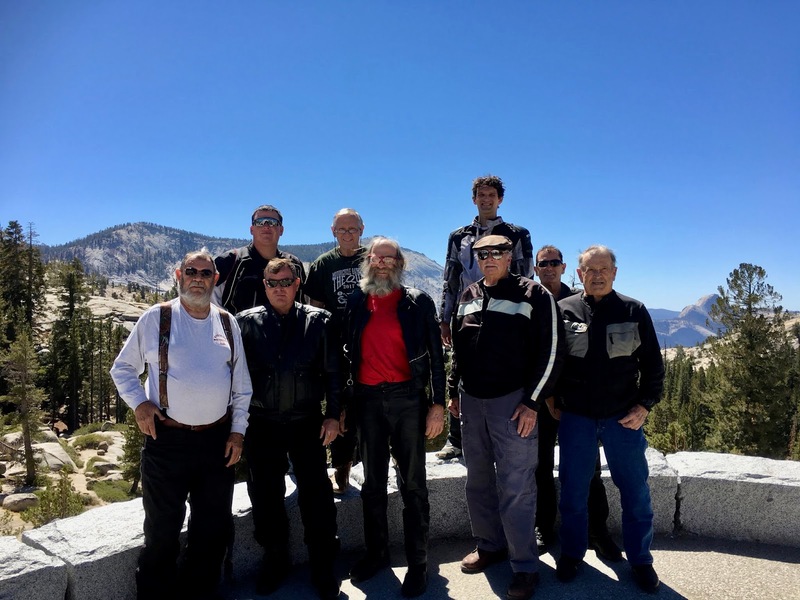 Had a great ride, 9 of us made the ride up and over Tioga and Sonora Pass. The picture is at Olmstead Point in Yosemite. Great way to celebrate my birthday, riding with friends in the Sierra's. The gentleman in the lower right of the picture is Arnold Castelhano. Arnold is now 80 years young and still riding. My inspiration for what I want to be doing in 12 years. Not many 80-year-olds doing 350+ miles rides. Added a couple of pictures of Arnold back in the 60's. I'm 51 and don't yet experience reflex reaction issues, I do experience general energy/weakness issues when exhausted but when I'm rested I'm still fast and good to go. So I think that there is a graduated process. Ride different bikes, ride differently, then when that no longer works, then quit. You could still take handfuls of cash and go help out racers! Hopefully you will have disposable income in retirement. When you can no longer walk to the track, then post on BARF. When you can no longer type then pray for a quick death. Volcans, "live long and prosper." Kingons, "live well and die quick. I agree with Klingon philosophy. The great question before us is not if God exists, or if there is life after death, or how did reality or the universe get created. But rather, is our brain the creator of consciousness or the receiver of consciousness? I believe it is the receiver and that then opens up a great adventure a head of us. I'll go one step further. I believe that many of the "fast" riders, pilots, racers, scuba divers, etc. living now, will be again together in 200 or 300 years as earth launches a fleet of ships, big bulky cement hulled ships with some amazing engines and then we will make contact with others and they will be shocked when we jump into their orbits. I never drink and ride...I would never allow riding to interfere with my drinking. Hear, "I am", send me an angel. As I ride, may an angel fly at my side! "I sence much BEER in you", Yoda (American Jedi Master). A friend gave me a book about the ills of drinking, so I stopped reading. I'm 61 and been riding since 1968. I raced motocross for 25 years and had a lot of injuries...some were serious....but I'm still riding street and dirt! I have days where I'm not able to ride because of back pain (I have two fused vertebrae and lots of arthritis) but I have more good days than bad and the "good" days are awesome! I did at least 8 track days this year, raced a TT and rode hundreds of miles off road as well as canyon carving the local twisties. I bought three new bikes this year and don't have any plans of slowing down just yet! This stuff keeps me young and alive! I'm also 60. I've been paying attention to how I am riding. If I feel I'm losing my edge, not seeing things clearly, reaction times etc. I may be delusional but I feel like my riding is as good as ever. I also ride a dual sport KTM 450 EXC. Now on THAT I can tell my skills have slipped. Mainly because I don't spend much time on dirt, and am not in the shape I used to be. My riding history is similar to yours: starting with a Honda 50 at 14 and still riding at 65 - albeit no longer on the Honda 50. I am also an avid bicyclist which I enjoy riding 1,000 miles at a time. I enjoy just putting along on one of my bikes - an 30 year old BMW, a Concours, and a still-to-be-finished 40 year old CBX. No canyon carving, no commute riding (retired with no interest in joining the Crazies out there), but a pleasant way to run errands and visit friends. As I get older, my reflexes are slower too, but riding keeps my mind alert. I feel very much alive even with I'm puttering about - as I attempt to stay alive. I am not risk adverse, but I am more cautious than I was 20 years ago. I also spend more time wrenching on bikes than I spend riding them; I enjoy this activity. I get satisfaction from keeping the old girls running. As I alluded to earlier, I am in the middle of a CBX restoration project. Yes, I will certainly enjoy getting the old bike back on the road. In the meantime, I am enjoying working toward that day. I just got back from a long Oakland hills ride. This was my first street ride in years. So much fun! No throttle pin, no triple digit speeds, just taking it easy and having fun. Most of the ride was normal to brisk speed, and I seldom passed anyone. I really enjoyed that. Smart; that's really the only way to ride the street. Sadly I've put more miles on my bicycle this year than both my bikes total! At 62 that's probably a good thing. I dunno, I think riding a road bike (bicycle) in traffic is prolly more dangerous than a moto. Mt Ham is a pretty good for a road bike. I ride a mtn bike because cars scare the shite outta me. I caught my toe on a rut riding my dirt bike a couple weeks ago and tweeked my knee substantially. I have vowed to turn down the pace a couple clicks. When conditions are good, that is harder than I had imagined. Mostly bike trails from Santa Rosa to Sebastopol, Graton, Forestville. I do not like to ride where cars are zipping by with a 50mph delta. I'm not one of those uber fit bicycle riders that HAS to ride in traffic to do their 100 mile ride. With a beer at the half way point! Bicycles are pretty awesome for thrills as we get older. That said, the same dangers, maybe more, remain. It takes self disclipline to turn it down a notch or two to when the conditions are sweet. It is hard. I have been riding almost every day and the conditions are sweet! it is hard to go slow. I know. I love getting into a downhill tuck and seeing how much speed I can get. I'd never go 45-50 mph on the street on a moto without full gear, but somehow I think it's fine to do it on a bike with a layer of spandex and a plastic styrofoam helmet.